Plan A Saratoga Wedding: Guide to Venues, Services & More! Getting married is an exciting and special time in your life, and the romance and history of the Saratoga Springs area makes it the perfect backdrop for your wedding, with a wide variety of exceptional venues for both wedding ceremonies and receptions. To help save you valuable time during the planning process, we've researched and located the finest wedding services in the region. Whether it's an idyllic spot in which to marry, a small specialty bakery for the perfect wedding cake, or a Saratoga caterer who specializes in your favorite cuisine, you'll find beautiful wedding venues, professional vendors and services and regional advice at ASaratogaWedding.com, a trusted online resource staffed by Saratoga locals for over 15 years! From planning tips to wedding vows, bridal gowns to honeymoon travel, you'll find everything you need to create the wedding you've always dreamed of in an area we are proud to call home. Find The Perfect Wedding Venue! Weddings come in all sizes, from intimate gatherings with a handful of your closest and dearest, to large gatherings of far-flung friends and extended family. Quickly find just the type and size of wedding venue you are searching for, whether it's indoor or outdoor, intimate or large, country casual or fashionably formal. Fine Affairs is your one-stop, professional, full service wedding consulting and planning company. No matter how big or small, we promise your wedding will be one that you and your guests will never forget! Your Vision, Your Style, Your Day....Your Fine Affair! Phone (518) 928-4906. 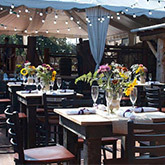 The Saratoga Winery is perfect for Bridal Showers, Wedding Rehearsal Dinners, and Small Wedding Ceremonies/Receptions. Dates always fill up fast, so don't delay, get your date on the books today!